Best Cordless Brad Nailer - Battery Powered And No Cords! Best Cordless Brad Nailer – Battery Powered And No Cords! There are so many different options out there so after talking to a couple friends who I consider experts in this, I finally made my decision. It comes with everything you need other than nails! Includes the battery and charger as well. 20 volt lithium battery that is designed to last for a long time on the job. 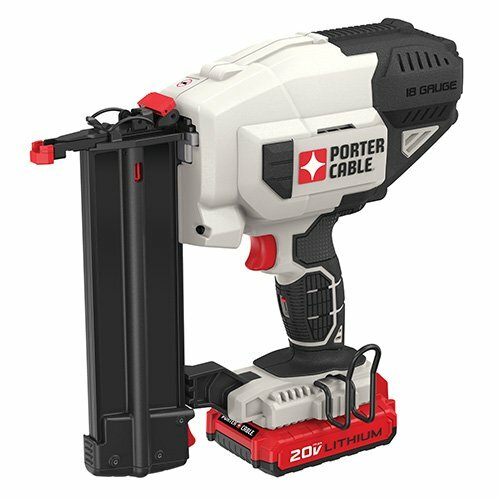 How did we decide on this as the best cordless brad nailer? The weights of each model vary greatly. Generally, a lower weight tool has less power. It is important to determine if portability or power is a priority for your projects. A few models will make a decent compromise between the two features if you have difficulties choosing a priority. The price range for a brad nailer can vary between approximately $100 and $400. A good rule of thumb is, the more features a tool has the more it will cost. Other things that go into determining the price are use level and quality. Tools are crafted in levels. One level of tool is crafted for the hobbyist or an infrequent user. There are then contractor grade tools. These tools are made to be durable and to be used frequently with a lot of volume in mind. Contractor grade tools always come with a higher price tag to accommodate bolstering the construction. It was not too long ago that nailers were always pneumatic. Developments and technology have resulted in nailers that are driven by other methods. These methods do not require a cumbersome pneumatic hose or even power cord. Today’s brad nailers come in cordless, battery powered or fuel cell powered nailers. The battery powered tool powers a motor that drives the brad. The fuel cell uses combustion to fire the brad into a material. Which is better depends on how you use the tool. Mostly, it seems based on preference. The battery models are not as noisy as the fuel cell models. The fuel cell models tend to have a more rapid firing rate. The battery nailers must bring the motor up to the correct pressure to fire the brad. This results in a minimal delay. The fuel cell explodes instantly upon depressing the trigger. For many people the delay is not an issue because it is not being used in a high volume situation. The battery models tend to weigh a bit less and you do not have to change the fuel cell cartridge. As you can see, the best is usually a matter of personal preference and need. This is usually the feature that people look for first when choosing a brad nailer. The bump trigger allows you to fire a brad upon contact with the material. The timed trigger intermittently releases a brad. If it has a timed trigger be sure that you can adjust the timing. It is frustrating using a nailer that fires too fast or not fast enough. It is best to have a nailer that has both an adjustable timer and a bump trigger. There are several brands of nailers on the market. Take the time to consider how, where and why you are using a nailer before setting out to purchase one. It will help you determine the features that are important for you. Maybe you are looking for something a bit different? There are a few different types of nailers that each have a specific purpose. Before you purchase a brad nailer be sure that the other types of nailers are not better suited for your projects. A framing nailer is a heavy duty nail gun that is designed to nail large and heavy duty projects like framing a house. They are typically contractor grade and utilize a pneumatic pump that drives a nail with air. Framing nailers are extremely powerful and are meant to drive through thick woods with little finesse. They often leave large imprints behind. The goal is a secure connection and cosmetic imprints are not a concern in this type of work. A finish nailer is a more light weight version of the framing nailer. At first glance they look very similar and the differences are minimal. The biggest differences are the imprints that are left behind and the mechanism used to drive the nail. A finish nailer leaves an imprint that is minimal and easily covered with a bit of putty. Finish nailers come in the pneumatic or cordless versions. A brad nailer is even more lightweight than the finish nailer. Obviously, a brad nailer fires brads instead of nails. The smaller gauge brad greatly diminishes the risk of splintering. It fires at a lower power level minimizing imprints. The imprints are fine enough that it usually not necessary to putty the indentation that is left behind. This type of nailer is typically cordless.